We’ve reached our goal of $4,000! Thank you for participating in our All Peoples GivingTuesday Fundraiser! Because of your generous donations, we will be able to assist our All Peoples Youth with College Books, Tours, Transportation, Supplies, Workshops, and Application Fees. Because of YOU, College Corner staff were able to assist seniors with over 40 college applications for FALL 2018! College Corner staff assisted seniors with a total of 17 FAFSA applications with an estimated total of $100,640 Pell Grant financial distribution for the FALL 2018! Your generous gift will assist our All Peoples Youth with College Books, Tours, Transportation, Supplies, Workshops and Application Fees. All Peoples Youth Director Deisy Huerta with Enrique Peralta, 2018 Cal State Northridge Graduate. Enrique, born and raised in South LA, was heavily involved in our All Peoples Youth Programs. He is one of many of our success stories thanks to supportive donors. 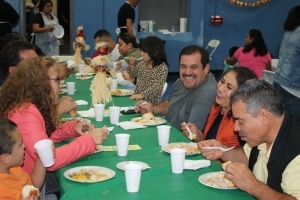 Community Thanksgiving Dinner Volunteers Needed! 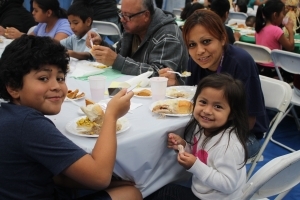 All Peoples Community Center is hosting our Annual Community Thanksgiving Dinner for our South Los Angeles Community. Volunteers are needed to make this event a success! Thanksgiving Dinner will be held Wednesday, November 14, 2018. Doors open at 2 pm and families will be served from 2 pm – 7 pm. Councilmember Price, event sponsor Toyota Financial Services employees, and Community Volunteers! Volunteers are needed between 10 am and 8 pm. We welcome any volunteers that are able to cover more than one shift! Pre-registration for volunteers is required. Please sign up HERE. Please contact Jennifer Santos no later than November 12, 2018 at 213.747.6357 ext 123 or jsantos@allpeoplescc.org. For individual that are unable to volunteer, we are also accepting in-kind donations and financial contributions. https://allpeoplescc.org/wp-content/uploads/thanksgiving-2017-195-e1539707323208.jpg 236 355 Shalanda Mays https://allpeoplescc.org/wp-content/uploads/LogoNewFull_Final_2_520x156-300x90.png Shalanda Mays2018-10-16 10:01:412018-10-17 10:50:56Community Thanksgiving Dinner Volunteers Needed! All Peoples Annual Gala “Sowing the Seeds of Change”! 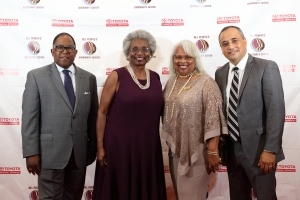 Olivia E. Mitchell, Assistant Chief Grants Administrator of the City of Los Angeles Housing + Community Investment Department, received the Dan B. Genung Visionary Leadership Award. This award honors a person of integrity who champions equal rights for all, challenges barriers that segregate individuals of different races, ethnicities, and religions, inspires people to value their own potential and reach beyond expectation; a person whose exceptional vision unifies communities, and motivates others to serve and to lead. Jose Figueroa, Assistant Vice President, Community Partnership Manager Broadway Federal Bank, received the Joe Ide Spirit of Community Award. This award honors an individual who embraces the mission of All Peoples, who is generous of time and effort to improve the lives of others, and who demonstrates a deep and abiding commitment to the families of our South Los Angeles community. Karina Basurto, received the Youth of the Year Award. This award honors a young participant who demonstrates outstanding character, respect for others, and exceptional promise to become a future community leader. Attendees were treated to the premiere of All Peoples micro farm video. We are grateful to Danny Galligani, and his friend Andrew Wright for volunteering their time and energy to produce, shoot and edit the video. I’d also like to thank Bird Amble, Helen Medina, and Lindsey Kish for their assistance with editing. 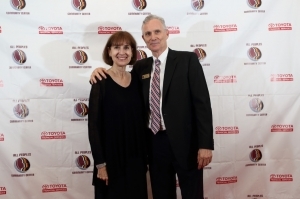 A special thank you to Toyota Financial Services (TFS) our Diamond Sponsor and to all of the sponsors and donors who made the evening a great success. You can see our donors on All Peoples website allpeoplescc.org. All Peoples Chair Seth Walworth with wife Sue Walworth. Last, but certainly not least the All Peoples Board of Directors and staff should be applauded for going above and beyond in making our event a total success. I am grateful for their service to the community and the Center. We were thankful for the presence or acknowledgement by our political representatives who presented all the honorees with certificates of appreciation and encouragement; Congresswoman Lucille Roybal Allard, 40th District, State Senator Holly Mitchell, 30th District, Assembly Member Reggie Jones Sawyer, 59th District, Supervisor Mark Ridley Thomas, 2nd Supervisorial District and Councilmember Curren Price, New 9th District. Founded in 1942, to sustain a community decimated by the internment of its largely Japanese-American residents, All Peoples has been a hub of vital resources for a neighborhood that has changed from Japanese-American, to African-American, to Latino today. 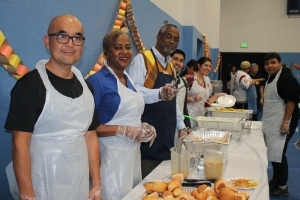 The Center serves hundreds of people of all ages, six days a week, with an extensive menu of educational, financial literacy, health empowerment, and family support programs at its facility just southwest of downtown Los Angeles. “Sowing the Seeds of Change” is our challenge for the future of legacy of All Peoples. We will continue to work in partnership with our program participants to address the issues that they deemed relevant. We will continue to encourage our young people to believe in themselves and never give up on the dreams they have for themselves, their families and this community. As staff, we have a responsibility to inform our community members through workshops, town hall meetings and public forums. Each day, we must endeavor to provide quality service to the youth and adults who enter our doors. Real Solutions, Real Heart and Real Service is who we are yesterday, today and in the future. For more photos the event, please visit our Facebook Page HERE! Congrats to our very own Anthony Jimenez, YouthSource Participant and NAVA Preparatory College Academy graduate, who is now attending Cal State LA! Community Member donations given for GivingTuesday 2017 were able to provide Anthony with a laptop for College. We are so proud of Anthony, and are wishing him the very best on his next chapter! We would like to Thank our Community Members for your continued support of our FamilySource Center’s College Corner! GivingTuesday 2018 is right around the corner, and All Peoples will be reaching out to Community Members again to help assist with gathering resources for our Youth for College Tours, Books, Transportation, Workshops, and Application Fees. In addition to admission into local Colleges and Universities, we’re proud to report that several of our Youth are also receiving acceptance letters from out-of-state Colleges and Universities. FamilySource Center funds cannot be utilized for student transportation to college, and sometimes there are not enough resources in the YouthSource participant’s family to afford transportation. That being said, All Peoples is focusing our efforts on raising money for College and University transportation costs. We invite you to Donate Your Air Miles to a Youth in need of transportation to College. We would like to publicly Thank Sheila Troupe who has generously paid for a YouthSource participant’s travel to Middlebury University in Burlington, Vermont. GivingTuesday 2017 Funds also assisted a YouthSource participant with traveling and moving expenses to Humboldt University. We currently have a YouthSource Participant that has been accepted to culinary school in New York, and he is in need of transportation. If you are able to sponsor this Youth or another Youth for the upcoming school year by providing air miles or a monetary donation, please contact Executive Director, Saundra Bryant at (213) 747-6357 ext 111 or sbryant@allpeoplescc.org. Thank you for your consideration. We look forward to keeping you up to date on our incredible Youth! Miguel Orozco and Margarita Ramirez are on the path to opening an independent contractor business and purchasing a home. Meet Miguel Orozco and Margarita Ramirez. The couple has been married for over 10 years, and are raising three young boys in South Los Angeles. In May of 2018, Miguel and Margarita enrolled in All Peoples’ Spanish Financial Literacy Workshops. During the workshops, they were educated on financial topics which includes: budgeting, savings, banking products, credit building, investments, and the “how to” avoid identity theft. Currently, the couple are receiving financial coaching sessions and recently enrolled in the IDA program. Miguel and Margarita are working on two financial goals: 1) support to establish an independent contractor business, and 2) purchasing a home. Miguel has already submitted his paperwork to become a license contractor. Miguel and Margarita are mono-Spanish speakers, and due to language barriers, they requested support from both their FamilySource Center case manager and financial coach to help interpret and change their business from a Limited Liability Company (LLC) to a Corporation (Co.) status. Currently, Miguel and Margarita are waiting on their submission results. In addition, both are seeking additional services at All Peoples such as: CARECEN services; and FamilySource Center’s College Corner to obtain college preparation workshops for their children. With assistance of our All Peoples and FamilySource Center staff, Miguel Orozco and Margarita Ramirez are on the path to opening an independent contractor business and purchasing a home. How would you describe All Peoples Community Center?All Peoples is a place that everyone can come and feel safe and accepted. No matter if they are experiencing difficulties or whatever the situation may be, the doors are always open here! Favorite Part of Your Job:My favorite part about my job is being a small part of making a difference in someone’s life. My Best All Peoples Story: It’s difficult to think of one story because there are so many. Anytime I get a chance to sit and talk to my [RSVP] volunteers is a good experience for sure! The stories they have to share, their life experience and advice they give is something I’ll always be grateful for. We’re so happy that Melanie Lopez is part of our All Peoples Family! JOIN US FOR OUR PARENT COLLEGE WORKSHOPS FALL 2018! Parent College Workshops started on Wednesday, September 26, 2018. Workshops will be held every Wednesday from 5:30 pm to 6:30 pm at All Peoples Community and FamilySource Center: 822 E 20th Street, Los Angeles, CA 90011. For more information regarding our College Corner Workshops, please contact: Susana Nieva or Elizabeth Martinez at (213) 747-6357 ext 147, snieva@allpeoplescc.org, emartinez@allpeoplescc.org.